Two years ago, Dan Abbott tried to end his life. Accompanied by his wife, the author Monica Wood, he has traveled a long road to recovery, and this is the story he lived to tell. Dan Abbott had been spiraling for two weeks, feeling overwhelmed and haunted by the thought that he was a fraud and that the image others held of him as a competent, able engineer and educator was false. 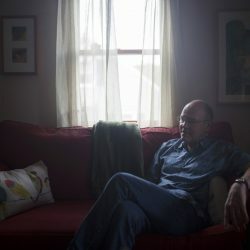 He told his wife, the distinguished Maine author Monica Wood, that he was feeling suicidal. She immediately removed his flare gun from their Portland home and drove him to the Maine Medical Center emergency room, so he could talk about his feelings with a psychiatrist. Abbott fooled them both. He told them what they needed to hear, that he would never kill himself. “It’s such a selfish act,” he said, and spelled out his plan for getting help. Instead, he got another flare gun, something he used often for his work with the Coast Guard. Two days after his trip to the ER, at around 10 a.m. on April 19, 2016, Abbott stopped on Interstate 295 near Brunswick and shot himself in the mouth. 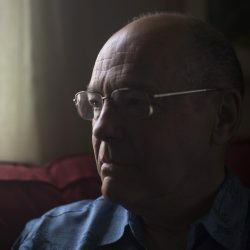 In the two years that followed, he underwent more than a dozen medical surgeries, an aggressive form of psychiatric treatment and a self-imposed isolation that sent him into a deep depression with feelings of shame and humiliation, particularly because of how he feared his suicide attempt would affect the public persona of his wife. Now, Abbott is speaking publicly for the first time about what he went through. He is glad to be alive, and wants to help other people who might be caught in a major depressive episode similar to the one he found himself in two springs ago, when he felt helpless, hopeless and convinced the world would be a better place if he wasn’t part of it. He wanted to end his life and had no concern how his death would affect the people who loved him and whom he loved. He probably would have died had a fellow traveler not stopped his vehicle and pulled Abbott from the cab of his pickup truck. Another motorist helped extinguish a fire that had begun in the cab, preventing an explosion. An ambulance arrived a few minutes later and paramedics performed a tracheotomy as Abbott was taken to the hospital. Abbott hasn’t considered suicide since, and this spring semester at Southern Maine Community College, where he has taught mechanical design, technical graphics and other courses in the architectural and engineering design program for nearly 30 years, was the most rewarding of his career, giving him a renewed sense of purpose. He’s speaking out because several things happened in June that made him realize the value of life and why it was important for him to talk about his psychotic break, the events that led to it and how he and Wood have recovered, individually and as a couple. 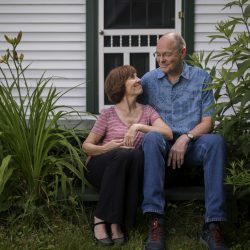 Dan Abbott, 67, poses recently with his wife, Maine author Monica Wood, in the backyard of their Portland home. In early June, he was at Massachusetts General Hospital in Boston recovering from delicate oral surgery to repair the roof of his mouth when fashion designer Kate Spade and, three days later, celebrity chef Anthony Bourdain both hanged themselves, prompting public conversations about mental health and suicide – and stirring something inside of Abbott, too. Even though he’d never heard of Spade, the news of her death was a jolt. He heard himself saying out loud, “Why didn’t she call me?” It haunted him that night, then hit him again when he heard about Bourdain. Those feelings aren’t uncommon but often go unspoken, according to a national suicide expert, who also said that hearing others talk about them can be very effective in suicide prevention. The other and perhaps larger factor that moved Abbott to speak publicly about his suicide attempt was the death of his sister-in-law Betty in late June. Betty was Wood’s elder by three years, and Wood has described her sister as “a human sunbeam.” Betty was developmentally delayed, with an absolute lack of shame or embarrassment about her disabilities and unrelenting kindness and concern for others. Her death was a blow to everyone in the family and within her community, and Abbott took it especially hard, because of the loss and because, in her death, he realized the value of a life. At the funeral, the family distributed two baskets of stones and asked people to take one with them and commit a random act of kindness on Betty’s behalf. The next week, Abbott told his wife he was ready to talk. His message of hope and life is timely. Suicide rates are up dramatically across the United States. This spring, the Centers for Disease Control and Prevention issued a report indicating that suicide rates rose in all but one state between 1999 and 2016, with a national increase of 25.4 percent during that time. In Maine, the rate of suicide rose 27.4 percent, according to the CDC. According to data from the Maine Department of Health and Human Services, an average of 229 people in Maine kill themselves each year. Nearly 45,000 people killed themselves in the United States in 2016. That is double the number of homicides, leading experts to begin treating suicide as a public health issue and not a mental health issue. Among men, the suicide rate was highest for those aged 65 and older, 32.3 per 100,000 people. Abbott was 65 at the time. According to the CDC, more than half the people who killed themselves in 2016 did not have a known mental health condition. That describes Abbott exactly. Dan Abbott poses recently in the living room of his Portland home. He said events in June, including the high-profile suicides of fashion designer Kate Spade and celebrity chef Anthony Bourdain, prompted him to reassess the value of life and to want to share his experience and his recovery with others who might be contemplating a similar fate. Abbott lived his life in relative anonymity. He was raised on a farm and worked alongside his father in his machine shop many years. A machinist himself, he’s always been handy with tools and fixing things. He’s served as a member of the Coast Guard Auxiliary more than 20 years, and most of those as a coxswain, commanding the boat. Abbott cannot point to one specific action or event that led to him feeling suicidal. It was a combination of things that added up, some related to stress at work, others that he imagined. But overall, it was a lifelong feeling of never quite measuring up in his own mind to how other people viewed him. Wood’s renown complicated the aftermath of Abbott’s immediate and long-term recovery, as well as Wood’s ability to deal with her own shock, grief and mental health. The suicide attempt was dramatically public, and the media covered it. Two days after the suicide attempt, the Portland Press Herald identified Abbott as Wood’s husband. Afterward, Abbott also assumed everybody judged him for his suicide attempt. Part of his recovery and his re-entry into the world involved accepting that people were supportive and understanding and grateful that he was alive. It took a long time to get there. When he returned home from a month in the hospital, Abbott went into a deep depression that grounded him to a standstill. His suicide attempt humiliated him, and he didn’t willingly leave the house for a year. He couldn’t take a shower, he could barely look at himself in the mirror. He stopped driving, stopped playing the guitar and lost all sense of his former self. He and Wood met with several counselors, who helped her a lot but did little for Abbott at first. A Jungian therapist, specializing in analytical therapy that bridges the conscious and unconscious mind, helped Wood understand some of the underlying issues that led to her husband’s suicide attempt, as well as how slow his recovery was going to be. Late that fall, just before the holidays, a psychotherapist recommended electroconvulsive therapy. “What is that?” Wood asked. The answer horrified her: Shock therapy, in which seizures are electrically induced in the brain in an attempt to relieve mental disorders. Their immediate answer was no. It sounded too scary. But eventually, they said yes. More accurately, Abbott consented to Wood’s wishes. “One thing that was happening is that Monica made virtually every decision,” Abbott said. “Everything I did, I did because she wanted me to. ECT I resisted and resisted and resisted, and then I just said, ‘You’ve caused her enough agony. If she wants you to do this, just do it.’ Every counselor, every therapy session, I just showed up. I literally didn’t know I had a new therapist until she told me that I have a different therapist. Abbott spent one month in the hospital in Portland and six months in therapy trying various drug protocols. Nothing worked. Each session lasted about 30 seconds, she said. Some people who undergo ECT experience memory loss. Abbott remembers most things from that time, but was surprised when he learned he had 18 sessions. He thought he had about five. Eventually, Abbott got better. Wood noticed gradual improvements over time. He started taking showers, getting dressed, cooking breakfast and leaving the house on his own. He also found a therapist who helped him talk through some of the big issues involving mental illness and perceptions. At one point, he told his therapist how embarrassed he was to be mentally ill. Does he buy it now? Last spring, a full year after his suicide attempt, Abbott made the decision to go back to work at SMCC. The school and his colleagues had been supportive throughout. His department co-workers covered his classes, and SMCC made clear that he could return at his will, when he was ready – and that the school absolutely wanted him back. He told his wife of his plan, and she offered to help by driving him to campus to ease his way back in. It happened to be spring break that week, and Wood knew the campus would be relatively quiet. The first morning she drove him to campus, he couldn’t get out of the car. The next day, he got out of the car and stood in the parking lot. The day after that, he walked to the door and unlocked it, and the fourth day he made it all the way to his office. Wood went with him. The next week, he went back again and stayed. He began reconnecting with his colleagues and students, and nobody turned their back or tried to walk away uncomfortably. Nobody shamed him, and he said he never felt judged. Even the machinists – the men’s men of the department, who, like Abbott, aren’t accustomed to talking about their emotions – let Abbott know they cared and understood, and other people on campus confided their own deepest emotions about suicide they had told to no one before. Abbott has become a safe person others can talk to about suicide, a role that he is comfortable in but feels unqualified to perform. Mostly, he listens. Bart Andrews, a licensed psychologist and member of the board of the American Association of Suicidology, said Abbott’s story is familiar. Many people suffer from feelings of inadequacy and believe they are living a life of lies by projecting themselves as competent and confident, and most of those people never tell others about their feelings. His organization promotes the understanding and prevention of suicide and supports those who have been affected by it. Andrews, who survived a suicide attempt 20 years ago, is involved at the national level in writing lifeline protocols and training suicide intervention specialists. Andrews also credited Abbott and Wood for their decision to pursue ECT. It’s an aggressive therapy, and it’s not for everyone, he said, but it has been shown to be effective in reducing depression and suicide. “It can have a life-saving result for some people. It can be the difference between having a quality of life and not having a quality of life,” he said. Abbott knows he’s lucky to have any life at all. He’s lucky – and smart – that he didn’t have a real gun in the house, or he’d be dead. He owns a gun, but keeps it elsewhere. He’s lucky someone stopped to help. He’s lucky he lives near excellent hospitals, surgeons, doctors and dentists. And as nearly everyone has told him for the last 40 years, he’s grateful to be married to someone like Monica Wood, who fought for him when he was unable to fight for himself. In the hospital room after his first surgery, Abbott was almost unrecognizable “except those beautiful blue eyes were those same eyes,” Wood said. He couldn’t talk, but he took her hand and spelled the words “I love you” in her palm with his finger. And with those blue eyes, he told her he was glad to be alive.